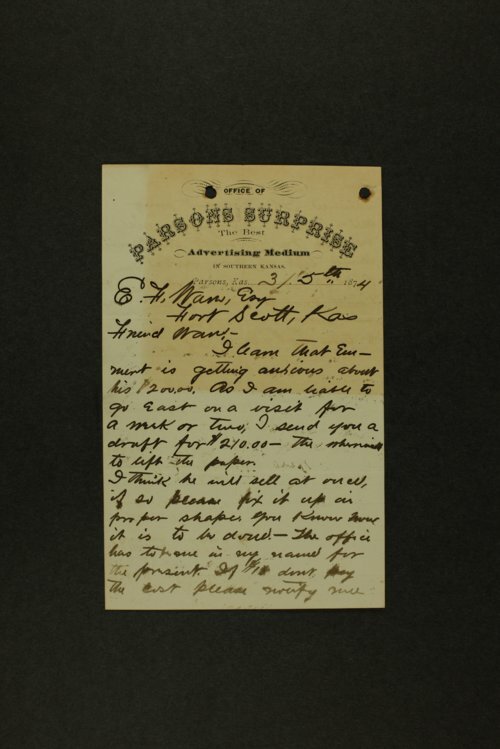 This is a series of correspondence to and from Eugene Fitch Ware (1841-1911). Ware moved to Fort Scott, Kansas, after the Civil War and became employed at the Fort Scott Monitor. In 1879, Ware began the first of three terms in the Kansas State Senate. During his terms of office, Ware introduced bills concerning railroads, life insurance, militia, and relief and support of the poor as well as bills of a more local nature. Ware moved to Topeka in 1893 to become a partner with Charles Gleed and his brother, James, forming the law firm of Gleed, Ware and Gleed. In addition to journalism, law, and politics, Ware used the pseudonym, Ironquill, for his literary and poetic achievements. His works include "Neutralia" and "The Rhymes of Ironquill". For a complete contents list of the papers of Eugene Fitch Ware, see the External Links below.